The DEADLINE FOR COMMENTS ON SITES TO BE PROTECTED IN THE LIVERPOOL LOCAL PLAN HAS BEEN EXTENDED. NEW DEADLINE IS WED 30TH APRIL 2014. In the new Liverpool Local Plan, being developed by Liverpool city council, you can call for the Meadows to be safeguarded as a special site. To ask for Sefton Park Meadows to be protected in the Local Plan, follow this link http://liverpool.gov.uk/council/consultation/consultation-on-the-liverpool-local-plan/ Follow the details under the ‘How to Respond’ section. To make it easier for you, we have filled in important information on the submission form LCC Form C. Just download this form as a Word doc, fill in your personal details and any additional information, and send it into the Council. You will also need to send this map to the right with LCC Form C. Just click on the map to download it. PLEASE REMEMBER TO SEND BOTH FORM C AND THE MAP TOGETHER TO THE COUNCIL. Return date is by 5pm Wed 30th April. Name it and Save it! Categories: Objections, Planning Process | Tags: Call for Sites Liverpool, Call for Sites Liverpool Sefton Park, Call for Sites Sefton Park Meadows, Consultation Call for Sites Liverpool, Consultation Liverpool Local Plan, Liverpol city council Local Plan, Liverpool City Council Local Plan, Liverpool Core Strategy, Liverpool Local Plan, Local Plan Liverpool, Sefton park Meadows Local Plan | Permalink. On 11th December 2013, Save Sefton Park Meadows campaign group received an email from Graham Marshall, vice chair of Merseyside Civic Society (MCS). On behalf of the MCS Council and members, he had written a Sefton Park Position Statement for MCS, supporting development on Sefton Park Meadows. He circulated this to ourselves, Mayor Joe Anderson, Chief Executive of Liverpool City Council, Head of Planning, and an article appeared a few days later in the Liverpool Echo. We are very upset over a number of issues related to this, not least that we had contacted MCS several times to ask for advice and support, taking account of their stated conservation and heritage protection objectives. No reply had been received, up to their Position Statement being published. And now we learn that MCS supports housing development on Sefton Park Meadows! We have discussed and agreed our response. We sent this email below to Graham Marshall and LCC. We will also be sending out a local media press release this week. Supporters – what do you think? Let us know your views on both Statements, and the MCS proposal of hosting an’ open and independent debate ‘. Further to your email below of 11 December 2013, with the Merseyside Civic Society Sefton Park Position Statement attached. I attach the Save Sefton Park Meadows Campaign Group response to the Merseyside Civic Society Sefton Park Position Statement on the proposed sale of Sefton Park Meadows for housing development. In your paper, MCS indicates its interest in hosting an open and independent forum to promote informed and balanced discussions on this important issue. 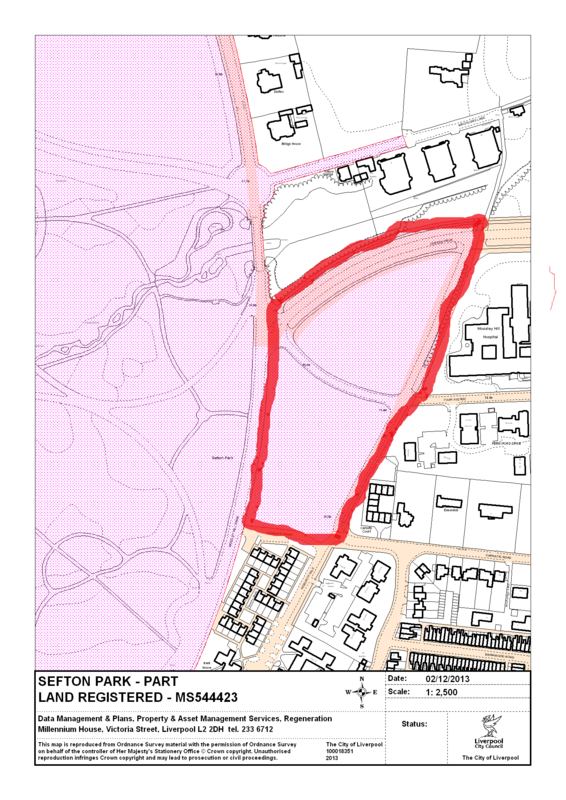 MCS have confirmed by the contents of their Position Statement that they support Liverpool City Council on the proposed sale of Sefton Park Meadows for housing development. Save Sefton Park Meadows Campaign Group is unclear how MCS could now host an open and independent forum to promote informed and balanced discussions on this important matter, when they have publicly declared their support for Liverpool City Council on this issue. Categories: Planning Process, Uncategorized | Tags: campaign, conservation, council, environment, housing development Liverpool, Liverpool City Council, Loss of openspace, meadows, Sefton Park, Sefton Park Meadows | Permalink.